Spending my summer vacation in Cleveland, my sperm-father, Jim Marsico, had the chutzpah to come to Jim’s Steak House. Shortly after I had turned eleven, school out for summer break, my non-sperm-father, Ray Rockey–five six, medium build, receding black hair slicked back and parted on the left–the owner of Cleveland’s then popular restaurant, Jim’s Steak House, had me, on a bright summer morning, outside washing the canopy over his restaurant’s front entrance. I'm up on a seven-foot stepladder with brush and bucket of water scrubbing away when I notice a green car pull into Jim’s Steak House parking lot and stop. After a few seconds, out of the car steps a man dressed in casual military uniform––long sleeve tan shirt, tan pants, black shoes–walking toward me. The man getting closer, I recognize him from–when I was a few years younger, a couple meetings, photos in a scrapbook, all that–it's my sperm father, Jim Marsico. Smiling, he waves, steps closer, says, “Hello, hi, how are ya” something like that. I climb down from the ladder, we shake hands, blah blah blah for a few minutes and out of the Steak House front door appears Jim Marsico’s ex (now married to my step father, Ray Rockey) my mother, Evelyn Rose–slim, forty-four, brunet, former waitress. Smiling, she and my sperm father exchange airport-screener type greetings. Greetings over, we three go inside the restaurant and sit at a four top (that’s a table that seats four) window table. Yak yak and shortly thereafter, my non-sperm father, Ray, shows up. Introduction, more airport screener greetings, Ray sits with us, five or so minutes of yak yak pass and a girl (Jim’s Steak House called the all female food servers, “girls.”) comes to the table, smiles demurely, leans over and whispers something in my mother’s ear. Anxious look from my mother, she excuses herself, and leaves. So you’ll know, Aunt Hilda, eyes and ears everywhere, is my step father, Ray Rockey’s aunt, owns Jim’s Steak House. So you’ll also know, after Ray’s mother (Hilda’s sister) died when Ray was just a tike, Aunt Hilda gained custody from Ray’s father, became his guardian, made him manager of Jim’s Steak House when he was twenty something. As to Aunt Hilda upstairs having a cow; she lives in an apartment above the Steak House. Her first husband, James Kerkles, who founded the restaurant umpteen years ago, died when he was fifty something. 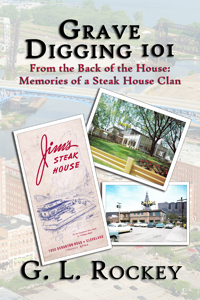 Shortly thereafter, Aunt Hilda sole owner of Jim’s Steak House, married the head of a local construction company, Frank Paul Mercurio who, among other things, dug holes all around Cleveland. Anyway, back to Aunt Hilda having a cow. Didn’t take a jackeroffer to figure it out–my sperm father was in her restaurant, sitting at one of her restaurant tables, drinking coffee out of one of her cups, chatting with her daughter-in-law, his ex-wife, my mother, Evelyn Rose, and me. Not to mention, my step father, Ray, joining in. Anyway, after an awkward whew moment, my sperm father's gone, I went back outside to my ladder and bucket; Ray went back to doing whatever he was doing in the back-of-the-house (that’s restaurant talk for the kitchen area), and Evelyn Rose went upstairs to calm Aunt Hilda. What you just read is autobiographical, a kind of prelude to my non- fiction book FROM THE BACK OF THE HOUSE-MEMORIES OF A STEAK HOUSE CLAN. A revised updated second edition GRAVE DIGGING 101 is to be released by BWL in the not to distant future.